In the last year, the civilian population rose by 1,695,000. Yet the labor force only rose by 274,000. 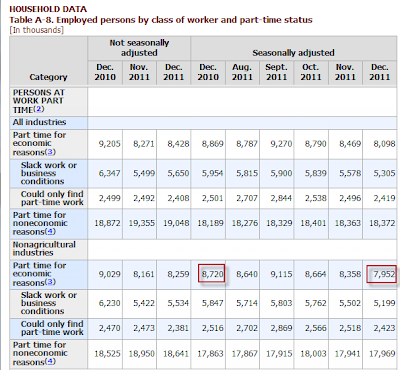 Those not in the labor force rose by 1,421,000. In December, the Civilian Labor Force dropped by 50,000. In December, those "Not in Labor Force" rose by a whopping 194,000, In November, those "Not in Labor Force" rose by a staggering 290,000. If you are not in the labor force, you are not counted as unemployed. Were it not for people dropping out of the labor force, the unemployment rate would be well over 11%. Madeline Schnapp at Trim Tabs Pinged me with a few of her notes this AM. 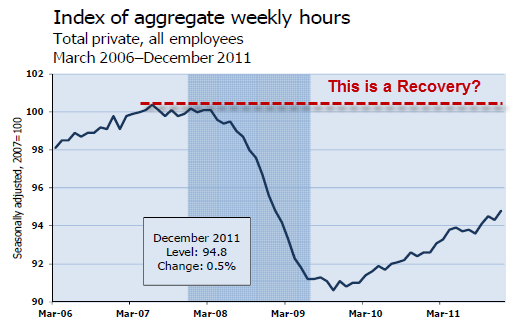 A couple of things to keep in mind re: the BLS employment December release. 1. December seasonals were -821,000 jobs (high, although not as high as January's will be, +2.1 million +/-). 2. The BLS survey reporting period contained five weeks in December as opposed to four. 3. The BLS survey is incomplete. The response rate in December was 71.5%. November count of Those Not in Labor Force revised from 487,000 to 290,000 which helps explain the slight revision upward in November unemployment rate. Here is an overview of December Jobs Report, today's release. The average workweek for production and nonsupervisory employees on private nonfarm payrolls edged higher 0.1 hour to 33.7 hours in November. The private sector has only recovered 36 percent of jobs lost in the peak-to-trough period of January 2008 to February 2010. Recall that the unemployment rate varies in accordance with the Household Survey not the reported headline jobs number, and not in accordance with the weekly claims data. After two months of increases, once again the labor force fell. This is not a good sign. Moreover, were it not for people dropping out of the labor force for the past two years, the unemployment rate would be well over 11%. 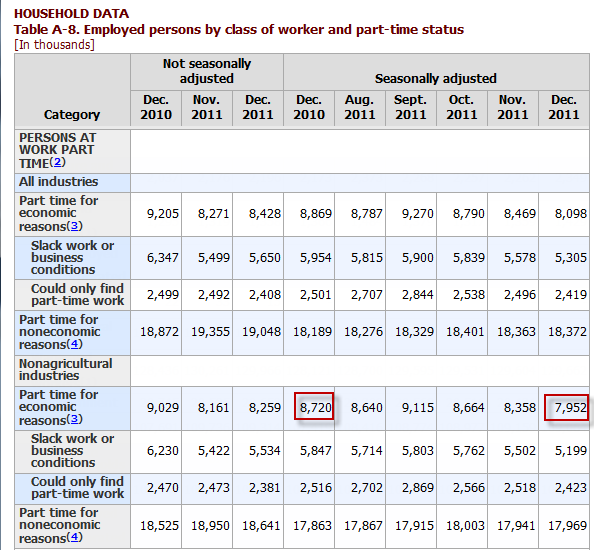 Please consider the Bureau of Labor Statistics (BLS) December 2011 Employment Report. Nonfarm payroll employment rose by 200,000 in December, and the unemployment rate, at 8.5 percent, continued to trend down, the U.S. Bureau of Labor Statistics reported today. 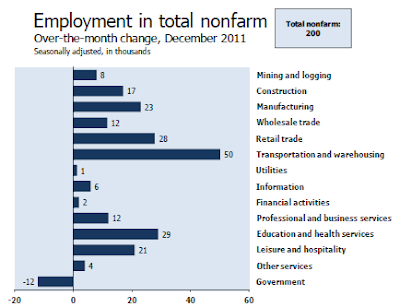 Job gains occurred in transportation and warehousing, retail trade, manufacturing, health care, and mining. 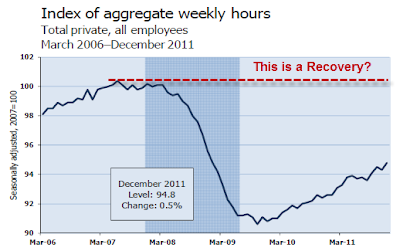 Notice that actual employment is lower than it was nearly 10 years ago. 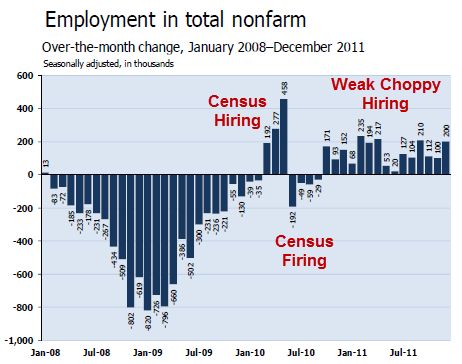 Between January 2008 and February 2010, the U.S. economy lost 8.8 million jobs. 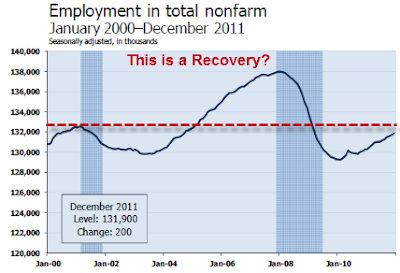 In the last year of the weakest recovery on record, 2.5 years old, the economy averaged about 137,000 jobs a month. Statistically, 127,000 jobs a month is enough to keep the unemployment rate flat. 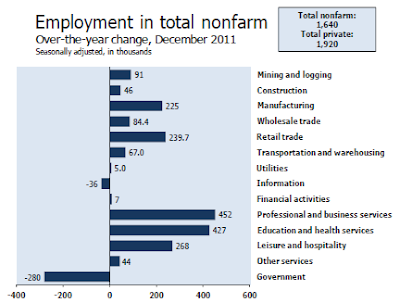 In 2011, the private sector added 1.9 million jobs, while government lost 280,000 jobs. Professional and business services had the largest employment gain (+452,000), followed by education and health services and leisure and hospitality (+427,000 and +268,000, respectively). These three industries contributed 60 percent of all private-sector job gains over the year. To put the net 1,640,000 jobs in perspective, it takes about 1,524,000 jobs to keep the unemployment rate flat. The unemployment rate is lower only because those not in the labor force rose by 1,421,000. 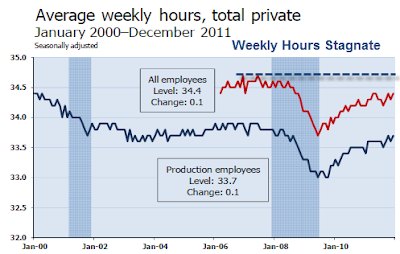 Over the past year, average hourly earnings of all private-sector employees have increased by 2.1 percent. The Consumer Price Index for All Urban Consumers (CPI-U) was up 3.4 percent from November 2010 to November 2011. 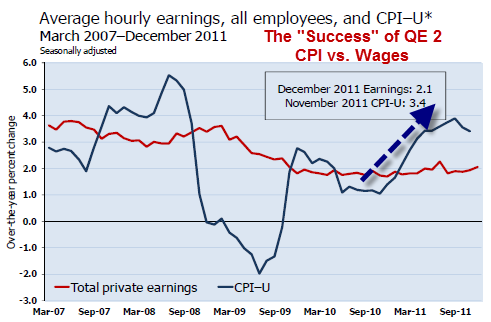 Not only are wages rising slower than the CPI, there is also a concern as to how those wage gains are distributed. The BLS Birth/Death Model is an estimation by the BLS as to how many jobs the economy created that were not picked up in the payroll survey. The BLS has moved to quarterly rather than annual adjustments to smooth out the numbers. In recent years Birth/Death methodology has been so screwed up and there have been so many revisions that it has been painful to watch. 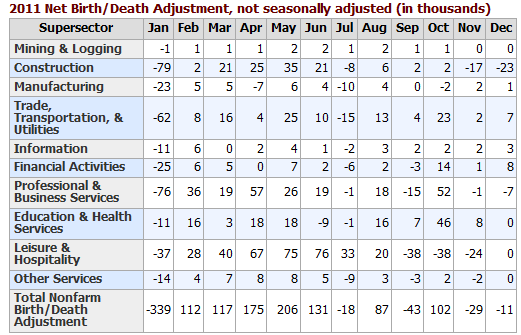 The Birth-Death numbers are not seasonally adjusted while the reported headline number is. In the black box the BLS combines the two coming out with a total. The Birth Death number influences the overall totals, but the math is not as simple as it appears. Moreover, the effect is nowhere near as big as it might logically appear at first glance. Do not add or subtract the Birth-Death numbers from the reported headline totals. It does not work that way. Birth/Death assumptions are supposedly made according to estimates of where the BLS thinks we are in the economic cycle. Theory is one thing. Practice is clearly another as noted by numerous recent revisions. Do NOT subtract the Birth-Death number from the reported headline number. That is statistically invalid. Historically, it has been exceptionally rare to see negative numbers in birth-death adjustments in months other than January and July. Data for much of this year actually seems reasonable. Part-time status shows some improvement vs. a year ago but remains elevated and the data series is choppy. Given the total distortions of reality with respect to not counting people who allegedly dropped out of the work force, it is easy to misrepresent the headline numbers. Digging under the surface, the drop in the unemployment rate is nothing but a statistical mirage. The official unemployment rate is 8.5%. However, if you start counting all the people that want a job but gave up, all the people with part-time jobs that want a full-time job, all the people who dropped off the unemployment rolls because their unemployment benefits ran out, etc., you get a closer picture of what the unemployment rate is. That number is in the last row labeled U-6. 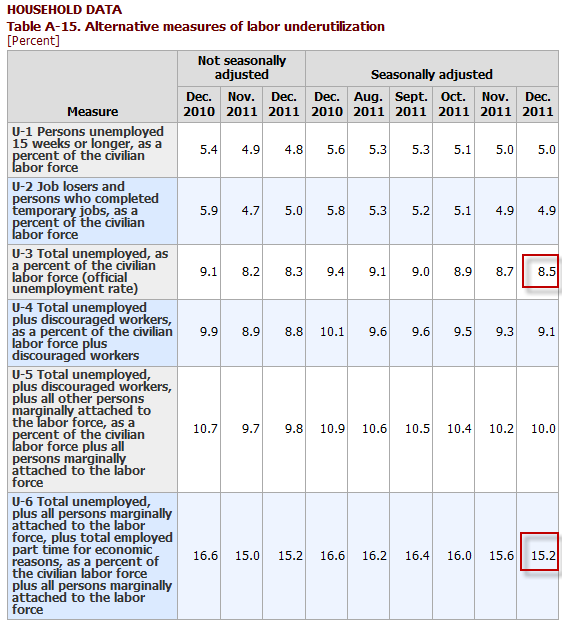 While the "official" unemployment rate is an unacceptable 8.6%, U-6 is much higher at 15.6%. Both numbers would be way higher were it not for millions dropping out of the labor force over the past few years. In the last year alone, the civilian population rose by 1,695,000. Yet the labor force only rose by 274,000. Those not in the labor force rose by 1,421,000. 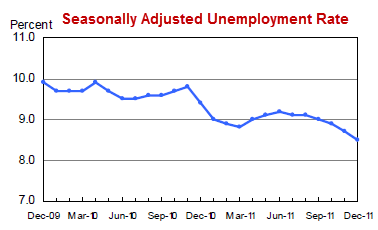 That puts a huge damper all all reported unemployment rate statistics. Things are much worse than the reported numbers would have you believe. The entire economic picture is on very thin ice given the clear slowdown in the global economy.